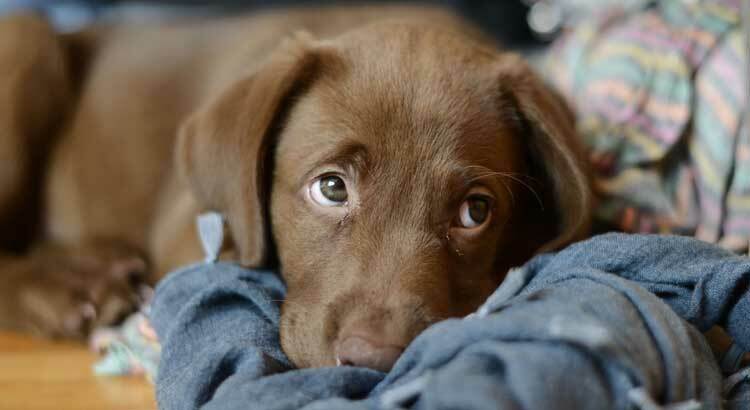 It’s almost time to bring your new Labrador puppy home, but what supplies should you have? There are several things a new puppy will need and it’s best to have them on hand before he arrives. When you are purchasing these items remember to plan for the size your Lab will eventually be. 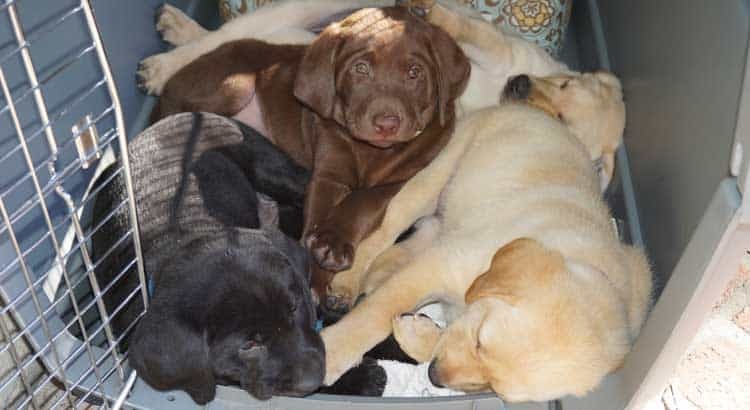 Most Labradors are medium-sized dogs, so you will want to make sure you purchase items like crates and beds in that size so you don’t have to keep buying new ones. Also, pick items that are rugged and will not wear or tear easily. You will want sturdy materials and items that are easy to clean. I know that some dog owners don’t like crates. They tend to think of them as cages. Your Labrador does not see them this way. 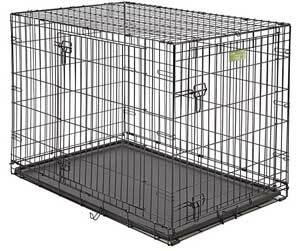 Your dog sees the crate as his den – a place that he can go to relax and retreat from the hustle and bustle going on in the house. When it comes to raising a puppy, I feel crates are essential. 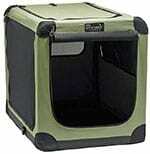 The crate can assist you with potty training and help keep the puppy safe when there is no one to supervise him. It can help keep the puppy from doing damage to furniture and carpets when you have to leave him alone. A crate also provides a place for him to sleep at night where he can feel protected and safe and won’t be able to wander off. You want a crate that is large enough for your Lab to stand up, turn around and stretch out in. You can buy a smaller one when he is a puppy or you can take the initiative and purchase one that will be big enough for your adult dog (this is my personal preference, as you will avoid the cost of purchasing two crates). You might want to section a larger crate off for your puppy just to make sure it doesn’t feel too big and also to keep him from thinking there is enough room for him to relieve himself in the crate if he needs to. Some larger crates come with a divider for this very purpose. Labradors tend to keep their sleeping area clean, so another way you can help keep him from relieving himself in the crate is to cover the floor with a bed or blanket. This way he will view the whole crate as his sleeping area. You will want to put some bedding in the crate. This can be a dog bed or just blankets. Some puppies may try to chew on the bedding so you will need to supervise him in the crate until you are confident he won’t do this. Putting a quiet chew toy in the crate with him may help keep him from chewing on the bedding. It may not seem like it, but puppies spend a lot of their time sleeping and a crate is a safe place for them to do this. Don’t ever use the crate as a punishment. If you do, then the dog will start to view his crate as negative reinforcement and won’t want to use his crate anymore. Don’t banish him there if he misbehaves. If the crate is used as a positive environment then your Lab will see it that way too. Once he is trained you don’t have to make him sleep in the crate every night unless that is your choice. However, if you train him early to like his crate this will make it so much easier when you travel or when he has to stay in one due to an injury. Our Labrador, Trooper, was 6 years old when we adopted him. He showed that he was crate trained before we got him because he immediately went into his crate when asked and always does so willingly. He obviously doesn’t see it as a cage. We also find it funny that our other dog, Max, who is a Maltipoo, loves to hang out in Trooper’s crate during the day. There are three different types of crates to choose from- wire, plastic, and cloth. Each has advantages and some people like to have more than one type on hand. In each case make sure you buy the correct size. You don’t want your Lab to feel cramped in his crate. These crates are great for ventilation, and the dog can still see everything that is going on. They are nice and airy in the summer. Many of them fold up or come apart easily for travel or storage. You can toss a towel or blanket over them if you need to protect your dog from the sun or wind. You can also do this if there is too much going on and he is becoming anxious. Obstructing his view can sometimes help him to calm down. Make sure that you purchase one that is sturdy enough to hold your Labrador, especially if he is very active or rowdy. These crates are not always super strong and an active dog may be able to break out of one. Some wire crates even have wood covers you can purchase that make them look more like furniture. Plastic crates are sturdy and are great for traveling. However, they don’t provide much of a view, so if your dog likes to see everything that is going on he might not like this style of crate as well. On the positive side, if you have an active Lab, this style is stronger and harder to break out of. If you plan to fly with your Labrador then you will need a plastic crate. Many say they are safe for air travel but always check with the specific airline to see what they require. Nylon mesh crates are lightweight, set up quickly, and fold up easily. You can take these anywhere. These crates are made out of shade cloth and plastic or metal pipes. This type provides shade as well as air circulation and they are great for family outings to the beach, park, or camping. The one problem with these crates is that since they are made of cloth they are easy for your Lab to tear up or chew through. 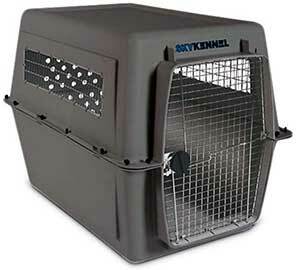 However, a Labrador that has been crate trained shouldn’t have any problems as he will already be used to crates. There are all sorts of different bedding options to choose from. There are pet beds in all imaginable colors, shapes, and styles. You can also just use a soft, cuddly blanket. One issue you will need to watch out for with bedding is chewing. Labrador puppies are chewers. You will need to supervise your puppy with his bedding until you are confident he isn’t going to chew it or until you train him not to. Some people like to purchase veterinary bedding. This is a synthetic, fleecy fur that is often sold in a roll. You can cut out the exact sized piece you need from the roll to fit your puppy’s crate or sleeping area. This product can be a little more expensive than your traditional bedding but it will last for years. It can go safely in your washer and dryer and it is difficult for a puppy to chew through. It is also soft and comfortable for your pet. This is the bedding that many vets and kennels use. This is a good type of bedding to start out with until you know your Lab won’t chew it up. Some Labradors will love their own beds, others will prefer your bed or the couch. If you don’t allow them on either of the latter they will be more likely to take to their own beds. Labradors love being near their owners so keep that in mind when deciding where to put his bed. Our Labrador will sleep anywhere, even without a bed or blanket, as long as he can be near us. If your Lab has a bed he uses regularly, make sure you bring it with him anytime you have to put him in a kennel. This will give him something familiar from home. You can also purchase outdoor beds that are waterproof if you need one for your Labrador when he is outside. These are usually made of the same material as patio cushions. These are waterproof and can simply be sprayed off with a hose to clean them. However, if your plan is to keep your Lab outside at all times then I would say you should rethink whether a Lab is the right dog for you. Labradors are people-lovers and they do much better as inside dogs. 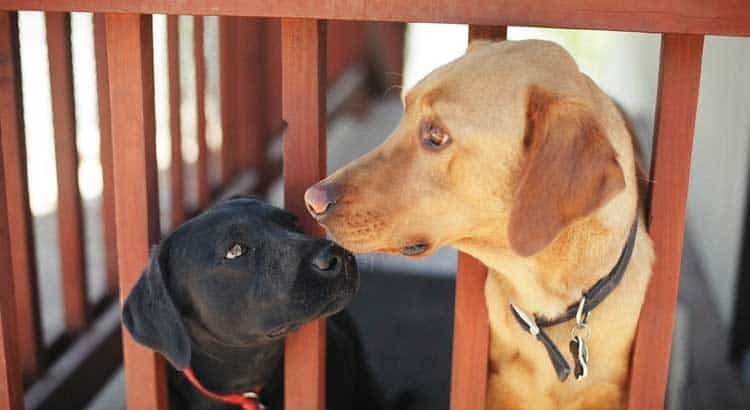 If you are interested in learning more about this often-searched topic we have an in-depth article called Are Labradors Inside or Outside Dogs. Check it out! There are dog beds that have “cooler pads” that you can keep in the fridge until needed for warmer days as well as heated beds that you can use for your older Lab when his arthritis causes him pain. There are so may bed types that I am sure you can find one that both you and your Lab like! Just like bedding, there are tons of food and water bowls to choose from. They range from cheap, lightweight plastic to heavy ceramic. They come in a variety of colors and designs. Your Lab will need at least 2 bowls – one for food and the other for water. I would recommend avoiding plastic bowls for several reasons. First, your Lab can easily chew it up. Once it has been chewed it can have sharp edges that can hurt your puppy as well as cracks where bacteria can settle in. Your puppy could end up swallowing pieces of plastic that could hurt him. Lastly, some dogs have allergies to plastic. Stainless steel food bowls are lightweight, cheap, and easy to clean. Your Lab won’t be able to chew up a stainless steel bowl. However, he can pick it up and carry it around, tip it over, and slide it across the floor. You can buy stainless steel bowls that are weighted and have non-skid bottoms. This helps keep them in place and makes them tougher to carry around. Because stainless steel bowls are cheaper, you can buy several to keep on hand and switch them out while others are being cleaned. Ceramic bowls are pretty, heavier, and easy to clean. They come in all sorts of colors and designs. They usually have a rubber or silicone ring on the bottom to keep them from skidding around and the weight makes it hard for your puppy to pick it up or tip it over. Ceramic bowls can’t be chewed. The main drawback for ceramic is that they are breakable. We actually have a mixture at home – a few stainless and a few ceramic. They are easy to keep clean either by hand-washing with hot soapy water or by running in the dishwasher. They are durable and neither type is expensive, although ceramic bowls cost a little more than stainless. When your new puppy finally comes home, try to find out what puppy food he has been fed up to that point. It is a good idea to keep him on that same food for at least a week or two while he gets settled in to his new home. It is also a good idea to switch foods gradually if you plan on giving him something different. Many times a breeder will send home a few days supply of the puppy’s food with you. You need to make sure you find a nutritious puppy food that has everything a growing puppy needs. Puppies are very active and their bodies are developing bone and muscle every day. They have very different nutritional needs than adult Labradors and it is important to feed them food made especially for puppies. Labrador puppies also have smaller mouths and need smaller kibble than adult Labs. The best puppy foods are low in carbohydrates and high in protein. If you are unsure what to feed him, consult your vet. A snap-on, nylon or leather collar is an essential accessory for your Labrador puppy. The collar provides a way for you to hold onto and control your puppy to keep him out of trouble. It also gives you something to clip his ID tag onto. I highly recommend that you keep a visible ID tag on your dog. If he gets lost this will give whoever finds him the immediate and necessary information to get him back home. Puppy collars come in many different colors and styles and both nylon and leather types are quite durable. To ensure a proper fit you should be able to fit four fingers flat against their fur under your Puppy’s collar. As your puppy grows, make sure that you periodically check the fit. You don’t want the collar to get too tight. Some people choose to use a head halter instead of a regular collar. A head halter wraps over the nose and fastens behind the ears. It works a lot like the head halter used on a horse. This accessory is used to lead your Lab and to ensure that he follows you. A common issue with this type of halter is that many dogs just don’t like it. Your Lab won’t be able to put his head down to sniff around as easily if he is wearing this. Also, puppies can get these halters stuck on different objects as they are exploring so you will need to keep an eye on him while he wears it. While some Labradors adjust to wearing a head halter fairly quickly, others never really grow to like them. Some people choose to use choke collars. I feel this type of collar is unnecessary and can hurt your Labrador. Choke collars can pull quite tight and injure your dog’s neck, especially if he’s a puppy. You should be able to effectively train your Labrador with a regular collar without needing the extra force of a choke collar. There are a couple of different types of harnesses on the market. There are benefits to either. It basically comes down to what you prefer and what seems to work best with your Labrador. On one type, the front-hook style, the leash attaches to a hook that is located at your Labrador’s chest. 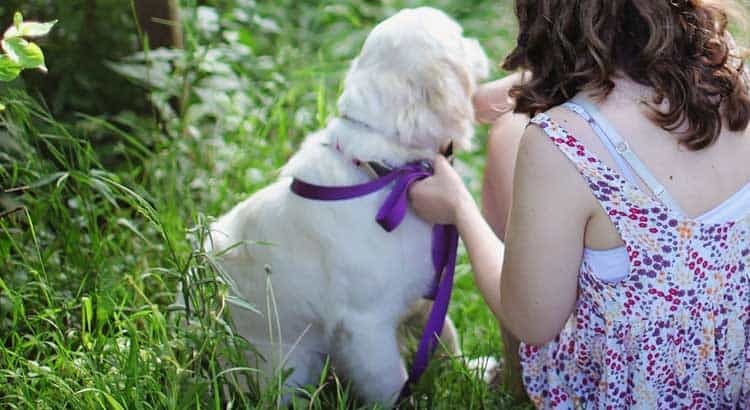 With the other type, the leash attaches at your dog’s back, between his shoulder blades. 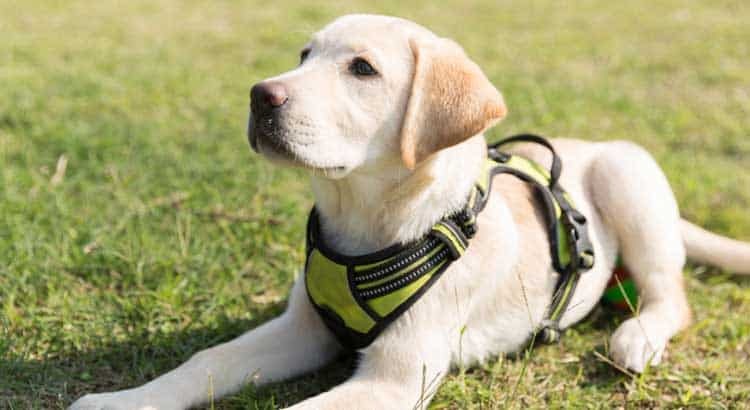 We go into much greater detail on the subject of harnesses in our article How to Walk Your Labrador. In this article, you’ll find helpful information on collars, harness, leashes, etc. Some people don’t use harnesses, they just attach the leash to the collar. I prefer using a harness as it puts less pressure on my Lab’s neck. I also feel that it gives me a little more control over him and he can’t slip out of it the same way he can slip out of his collar. As with collars and harnesses, there are several types of leashes on the market as well. They come in different materials and many different colors. The leash should be about 4-6 feet in length. Nylon leashes are cheap, durable, and easy to clean. They also dry out fairly quickly if they get wet. Leather leashes are a little pricier but are also durable and get softer as they age, which makes them more comfortable in your hand. However, they dry slowly and may shrink when they get wet. The main drawback to either type of these leashes is that your Labrador may try to chew on them. It is important to train him not to do this. Once he starts getting into the habit it will be hard to stop him and he can easily ruin them. There are also bitter-tasting sprays that you can put on the leash that will help keep your dog from chewing on them. The only type of leash that isn’t chewable is a chain leash. However, these leashes are heavy and noisy. They can also hurt you or your dog and they are not very comfortable in your hand. In my opinion, it is better to train your dog not to chew on his leash rather than use one of these. If your Lab is well-trained and won’t go running off then you could use a retractable leash. This leash gives him more distance to explore. However, this type of leash can easily be yanked out of your hand so only use it if you know your dog won’t pull too hard. I learned the hard way how easy it is to lose control of these. My dog took off after a squirrel and yanked it right out of my hand. Then the sound of the leash scraping on the sidewalk behind him scared him even more and made it hard to get control of him again. An ID tag is a great item for your puppy to have to help make sure you will be reunited with him if he ever gets lost. Many cities require that your dog have an ID tag, so make sure you check to see if this is required in your area. 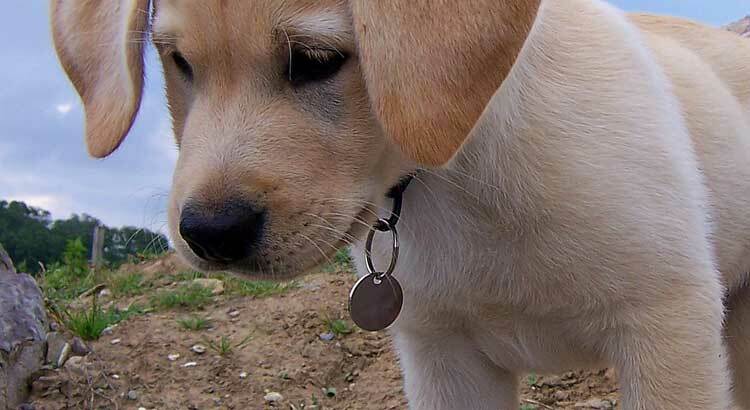 Your puppy’s ID tag should be made of metal or durable plastic. The most important information that should be on it is your phone number, including the area code. Your cell phone number is probably the best one to have on the ID, as that is how you are most likely to be reached. You can also include your pet’s name, your name, and your address if you would want to. The ID tag should be connected to your puppy’s collar so it will be easy to access. Microchipping is now a very common way to identify your dog. A tiny microchip, about the size of a grain of rice, is injected just under your dog’s skin between his shoulder blades. This permanent chip can be scanned digitally at most animal shelters and veterinary clinics. When the chip is scanned it gives the worker a number that can be entered into a computer database which will give them all the information needed to reconnect you with your Labrador. When you get your puppy microchipped you will pay a small fee to have him registered in the database. Most shelters now automatically microchip any dogs that they adopt out. 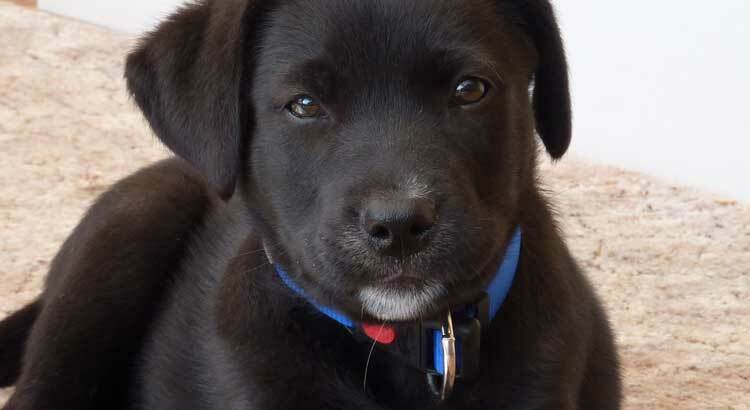 In my opinion, your Labrador puppy should have an ID tag and also be microchipped to ensure that you can be reunited with him if he gets lost. There will be times when you need to leave your puppy home alone for a longer period than you would want to crate him. However, you also can’t give him full run of the house because of the damage he could do. A puppy left to wander the house will chew up items and relieve himself wherever he wants to. There are a few different items you can use to help keep him secured in a specific area while you are away. Baby gates or dog gates are a great way to block your puppy into a specific room, like the kitchen. It is a good idea to pick a room that doesn’t have carpet as any messes will be easier to clean up. These gates come in different sizes to fit different doorways. You can also use these to keep your puppy out of certain rooms or to protect him from stairways. Most gates are pressure mounted against the jam of the doorway. Make sure it is tall enough that your puppy can’t jump over it. This kind often needs to be removed for people to get through. If the gate needs to be permanently in place you can buy a nicer one that will mount to the door frame and usually opens and closes with a latch. I highly recommend using a gate to block a doorway rather than closing the door as your Labrador can scratch up a closed door quite easily and he can cause a lot of damage. An exercise pen is like a playpen for your puppy. These pens are portable and are usually made out of wire or heavy duty plastic. They are great for when you want to have your puppy confined to one area but don’t want to put him in a crate and don’t necessarily want him to have full run of an entire room. You can leave your puppy in his pen when you need to leave him alone for a while and you can also put him in there during times when you need to get things done and don’t want him running free through the house. The pen helps your puppy feel like he is still a part of everything going on. It can also keep him nearby while you cook or clean so you can watch for times that he needs to go out. You can keep a small crate or bed in his pen so he can go there to sleep. Make sure you leave a water bowl in there so your Lab can get plenty to drink. You will want to have a bowl that your puppy can’t easily tip over if you don’t want to come home to a wet mess. It is also a good idea to have an area where you lay out puppy pads or newspaper for him to use for his elimination times. Make sure you buy one that is too high for him to jump over and strong enough that he can’t knock it down. If you need to keep your Labrador outside while you are away and you don’t have a fenced yard, then a dog run is a necessity. These are usually made out of chain link. You will want it big enough that there is room for a sleeping area, food and water, and also a place for going potty that isn’t too close to the other areas. You need to make sure he can’t climb over it or dig under it. Your Lab will need a place to go to stay warm when it’s cold and cool when it’s hot. Your puppy will be groomed throughout his whole life so it’s important to start getting him used to the grooming process and the tools that are used while he is still quite little. Brush his coat often. Labradors shed a lot so brushing will become a very important habit. Start while he is young so he will be used to being brushed. Many puppies enjoy the grooming process, especially being brushed. If you keep your Lab well-brushed it will help keep the shedding down. Start teaching your puppy to enjoy getting bathed and having his teeth brushed. Play with his feet a lot so he will be used to having his feet touched and won’t be bothered as much by his nails getting clipped. Essential grooming supplies to have on hand are dog shampoo, a rubber curry brush, an undercoat rake, a shedding blade, a wire slicker brush, a bristle brush, toothbrush and toothpaste, nail clippers, scissors, and ear cleaner. If you’d like to learn more about how to properly groom your Lab, we’ve created an Ultimate Labrador Grooming Guide. In this guide, you’ll find helpful information and tips on supplies and proper grooming methods. We’ve also created a guide on How to Properly Clean Your Lab’s Ears. Make sure to check out these helpful resources. Puppies need toys for different reasons. They need toys they can chew on. Labrador puppies will chew and it’s best to train them that there are specific items they are allowed to chew on. They also need toys that will keep them active and stimulate their minds. All puppy toys should be safe, durable and washable. Make sure that any toys you buy for your puppy aren’t too large or too hard for him. Don’t give him any toy that he can swallow. When it comes to chew toys, bones and rawhide are not a good idea. Your puppy can break off and swallow pieces and injure his mouth or stomach. Strong, rubber chew toys, like Kong toys, are a good bet. These are durable and hold up well to a puppy’s gnawing. You can also fill them with treats for your puppy to discover. 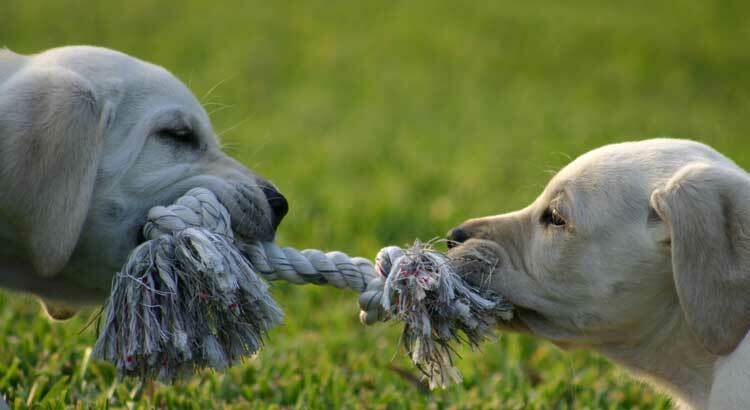 Thick rope toys with knotted ends are great for tug-of-war but be sure to supervise your puppy with them. If the rope starts shredding or breaking off your puppy can swallow the pieces and this can be dangerous. Puppies love toys they can chase, like balls or squeaky toys. Make sure the ball isn’t too small or too large. You don’t want your puppy to accidentally swallow it or for it to hurt his mouth. Puppies love the toys that squeak but always make sure they are durable, you don’t want your puppy swallowing that little squeaker inside. It doesn’t take fancy toys to keep your Labrador happy, just strong, durable ones. You can rotate his toys to give him something new to play with from time to time. Don’t give him too many toys as this can overwhelm him. He just needs a couple of good ones to play with at any given time. Your puppy will have accidents in the beginning so be prepared. When your puppy potties somewhere it leaves behind a definite odor. If he smells that odor he will probably potty there again. Be prepared with a cleaner that is specifically made for this type of mess. We use a product called Nature’s Miracle and it does a great job. Two other clean-up tools that you may want to have on hand are a pooper scooper and poop bags. The main advantage of a pooper scooper is that it saves your back from having to bend over to clean up all of your puppy’s messes. However, they can be awkward to carry around so many people choose not to use them. You will definitely need poop bags, though. You need these to clean up after your puppy while you are on walks and even for cleaning up your own backyard. You don’t have to buy specific poop bags. If you like, you can just use a grocery bag or a Ziplock bag. I prefer the poop bags sold in stores as they seem to be thicker and some are even treated with odor fighters. An antihistamine (such as Benadryl) for insect bites, stings, poison oak/ivy, etc. Treats are one of the best ways to train your Labrador puppy. They are highly motivated by food so make sure you have plenty of tasty treats to use as part of your training regime. Labradors especially seem to love bacon and chicken treats. Make sure you don’t overdo it; use the treats sparingly. This is not an essential supply but clickers can be very useful tools when training your puppy. You use the clicker to let the puppy know when he has performed the desired behavior. As the puppy gets used to this tool and what the sound means it becomes a very useful communication tool between you and your puppy. If you use training treats along with the clicker it will help teach the lesson even faster. Health insurance is not an essential tool but some pet owners find it to be very useful. 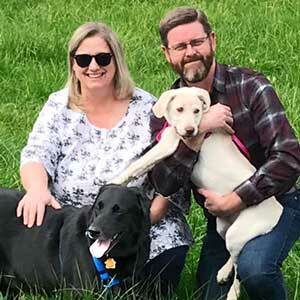 There are so many new life-saving procedures that can be performed on your dog and a lot of them are quite expensive. Dog health insurance works a lot like your own medical insurance. You pay premiums and the insurance covers certain costs. There are different levels of coverage that charge different premiums and cover different things. If you decide you want insurance for your puppy, make sure you read over the policy carefully and know everything it will or won’t cover. Previous Post:Why Do Dogs Eat Grass?